Rope: 200’ of rope (or 2 x 100’ ropes), 80’ webbing, 13 rap rings, harness, descender, ascending gear, helmet, carabiners, canyon jug or 2 drybags, a warm wetsuit, pothole escape gear. NOTE: The water in this canyon is very cold, wetsuits are required year round. There are several keeper potholes that are in play when water levels are low. The canyon can be descended with mostly natural anchors. Bolts have periodically appeared in the canyon they may or may not be available for your use. Key rappels in this canyon feature bolted anchors; no additional artificial anchors are needed. Take care not to destroy the rare moss while on rappel. DRIVING DIRECTIONS: Illusions is located northwest of Sedona in the Red Rock Secret Mountain Wilderness. From Phoenix, Take I-17 to the Fort Tuthill exit. Go left. At the second round-about go north to Purple Sage Road to FR 532. Take this to FR 231 and drive to the last left off FR 231 before the tower – Possibly FR 9018M. Rappels: About 13, depending on down climbing skill of the party. TRIP DESCRIPTION: This is for the sneak route. 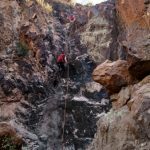 The first challenge of the canyon is to locate an entry that avoids the thick brush in the upper reaches of the drainage. From non-descript parking spot, walk west to the side of a steep drainage. This is the east for of Illusions. From the rim, hike down the steep, pine needle covered slope of the side drainage. You will follow this drainage to the first rappel, which is a two stage 100’ rappel down a mossy slot to a shallow pool. Continue down canyon until to reach the main branch of Illusions. You’ll find a slope down canyon right that slopes into the main part of the canyon just before the west fork enters the main canyon. A short distance down this main drainage a slippery moss covered boulder creates a short drop-off that presents an inconvenient obstacle. Beyond the boulder water soon appears underfoot and you’ll want to put on your wetsuit. After walking through a short set of shallow, wet narrows the technical challenges begin. Rappel 1 15’ from a sling around pine tree on canyon left. Rappel 2 20’ from a pinch point on the left into a pool. Rappel 3 30’ from a tree on a bench on the left. 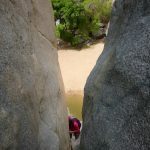 The canyon enters spectacular narrows and a downclimb at a natural arch into a shallow pool, followed by a climb down a sandstone corkscrew. More narrows and a few short swims and the canyon widens. You can continue directly down the canyon to negotiate two small drop-offs or climb around onto a bench on canyon left and complete a two stage rappel from a big tree (the first stage is from the bench back into the canyon, the second is a short drop within the canyon itself. Rappel 4 20’ from a bolt and hanger on the left through an arch into a very dark room with another arch providing the escape route. Rappel 5 30’ from a bolt on canyon right into a pool. Continue down canyon through beautiful narrows completing a few swims. Rappel 6 15’ from a sling around the horn of a choke stone into shallow pool. After walking through a narrow hall, slide down small chute and enter a short tight section of wet, twisty narrows to a log jam. Climb over log jam down into a pool. Rappel 7 Then use a sling around several dead logs braced across the slot to perform a 40’ rappel into a nice room (this drop is now bolted on the left). 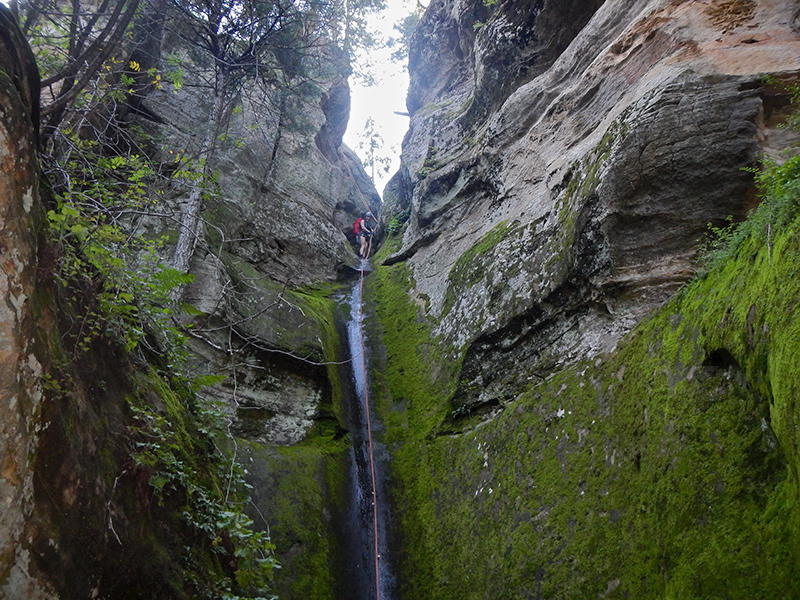 Rappel 8 25’ from a sling around a large wedged dead stump down slippery wall into a pothole. Below is an extremely dark and wet section of narrows. Rappel 9 15’ with an awkward start from a sling around a log, followed by a chute that can be downclimbed with some care. Rappel 10 8’ drop that uses a sling around small rock wedged in crack in wall on canyon left for an anchor for a rappel or hand line into a pool. Climb out of the pool and slide down a corkscrew which has a drop 5-foot drop at the end into a frigid pool entering a beautiful room. Looking back up canyon you’ll see multiple deep grooves in the wall created by floods as the floor of the canyon eroded downwards. Rappel 11 bolts and hangers on canyon left as an anchor for a 10’ rappel into a possible keeper pothole. Rappel 12 100 feet down a beautiful mossy wall into a sandy room (by rappelling slowly and carefully down the wall with flattened feet you can avoid creating ugly skid marks through the moss). The canyon widens slightly and soon reaches consecutive 8-foot drop-offs that can be descended without rope by experienced climbers. The first is along a log which may require a short jump at the end, followed by a vertical drop which features a small softball sized bore hole which may be used as a hand hold to hang from, before dropping down into the room below. Rappel 13 a 40-footer from a sling around a pinch point at the top down a sculpted chute into a pool. Exit the pothole and downclimb a short distance into another pool that has 2 bolts and hangers on the right that may be used for rappel 14. Rappel 14 The drop is 100 feet in length and ends in a potentially deep keeper pothole. The pothole has an unfortunate history of capturing bear cubs and small animals and as a result is sometimes quite unpleasant. Currently the pothole is mostly full with debris from the Slide fire and can easily be walked out of. Sneak Route Exit look for a drainage on canyon right about 120 feet past the keeper pothole. You may want to keep your helmets on because of the loose rock ahead. Make you way up the right drainage as it climbs steeply out of the canyon. You’ll continue up the right drainage until you reach a cliff face. Turn left ascending steeply, keeping near to the right wall until you reach the top of the ridge. From the top of the ridge you’ll see a break in the cliff band to the south. Head up it and continue climbing the steep grassy hill until you reach the road. Turn left and walk the road about .5 miles back to your vehicle. Rappel 15 25’ from a tree on canyon left into a shallow pool. Remove your harness and wetsuit (if you haven’t already) and continue down canyon a short distance to the junction with the West Fork of Oak Creek Canyon.